To make the crumb crust you’ll need flour, sugar, brown sugar, baking powder, salt, cinnamon, unsalted butter, vanilla extract and an egg. 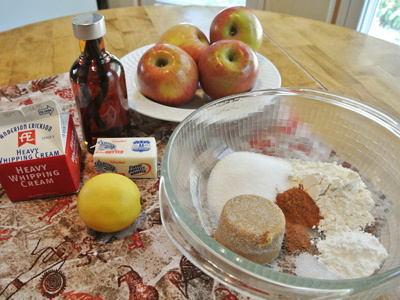 Mix together the dry ingredients of flour, sugar, brown sugar, baking powder, salt and cinnamon. Cut in the butter with a pastry cutter until the mixture becomes coarse and crumbly. 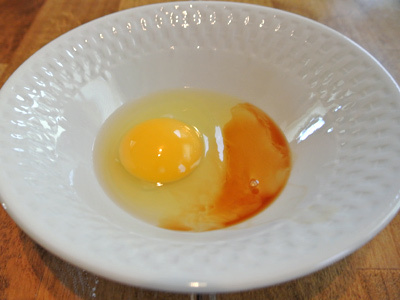 Whisk together an egg and a splash of vanilla. Add the egg and vanilla into the crumb mixture and stir. 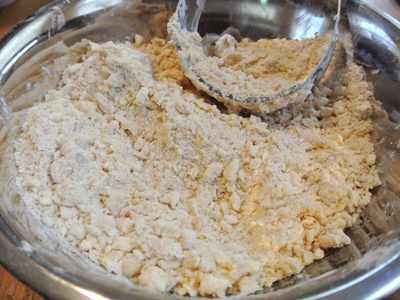 If need be, use the pastry cutter to blend into a crumbly mix. 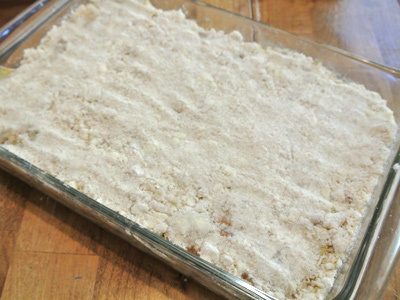 Take about half the crumb mixture and start pressing down with your hands into a 9 X 11 baking dish. Set aside. I scaled down an apple pie recipe for the filling. 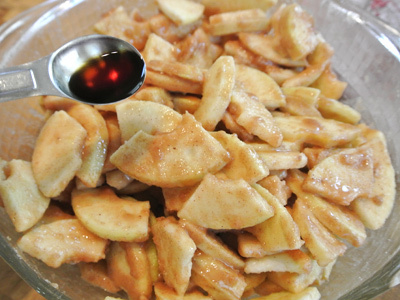 It includes 4 apples (I used Fugi), sugar, brown sugar, flour, cornstarch, cinnamon, nutmeg, lemon juice, vanilla, butter and heavy cream. Here’s a sneak peak at the Vanilla Extract that I started in August. The colorization is turning to a rich amber brown color and the aroma is abundantly vanilla. It should be ready to use in mid October. 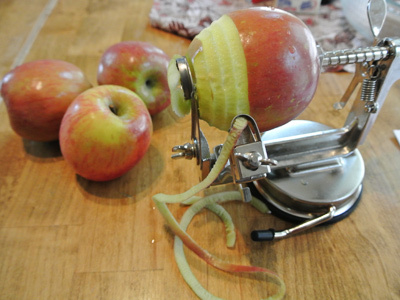 You can peel the apples by hand, but if you have an apple peeler it makes for quick work and practically peels, cores and slices the apples for you. 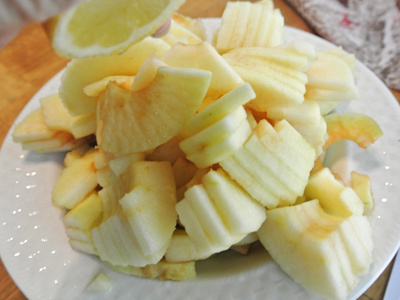 Once the apples are sliced and cut into pieces, squeeze a tablespoon or so of fresh lemon juice over the apples. 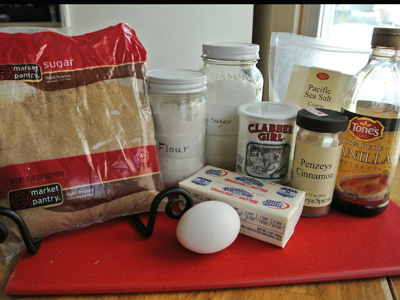 Mix together your dry ingredients of sugar, brown sugar, flour, cornstarch, cinnamon, nutmeg, and salt. Add the heavy cream and melted butter and give it a good stir. 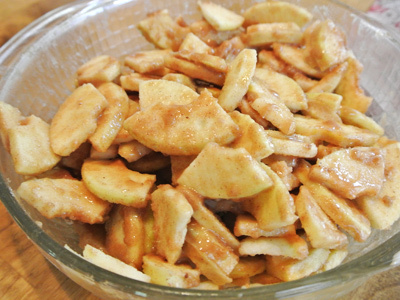 Spread the apple mixture over the bottom crumb crust. 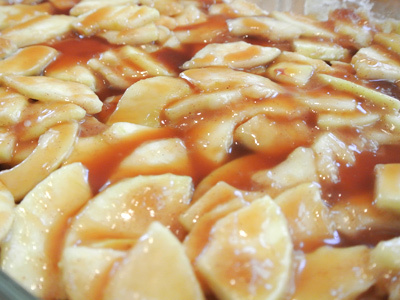 Drizzle as much or as little salted caramel sauce over the apple filling. I used probably 1/3 cup. One last look before adding the top crust! 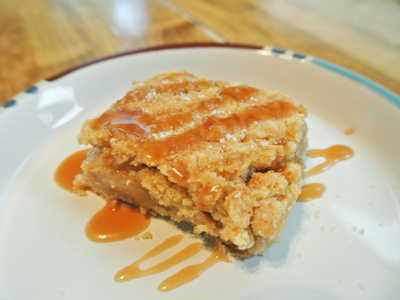 Pat a layer of crumb topping over the caramel apple filling. 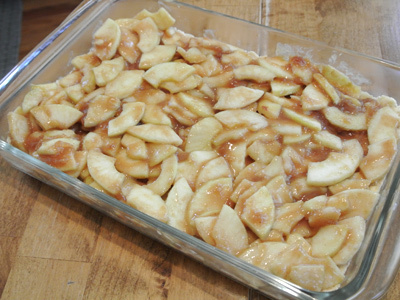 Bake at 375 for 35 – 40 minutes or until the top is good and browned. That looks good! Let it cool completely before cutting bars. 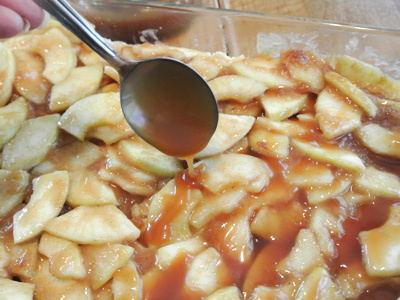 Drizzle extra salted caramel sauce over the top and add a pinch of grey sea salt. 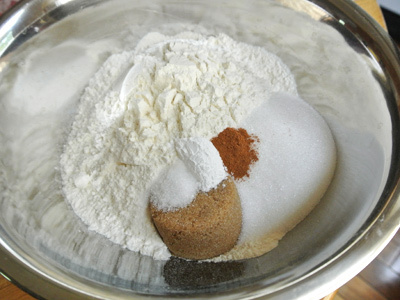 Mix together dry ingredients of flour, sugars, baking powder, salt and cinnamon. Cut in butter pieces with a pastry cutter until the mixture is coarse with butter pieces no larger than pea size. 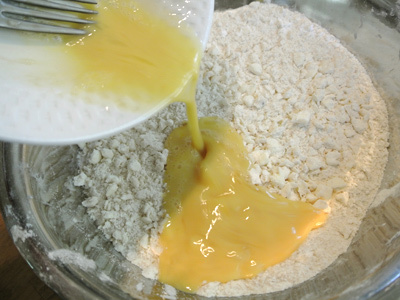 Whisk together the egg and vanilla and pour into the flour and butter mixture and combine until the mix becomes crumbly. 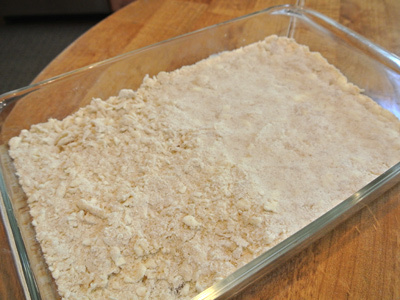 Take half of the mix and pat down into a 9 X 11 inch baking dish. Set aside. Peel, core and slice apples. Sprinkle with lemon juice. 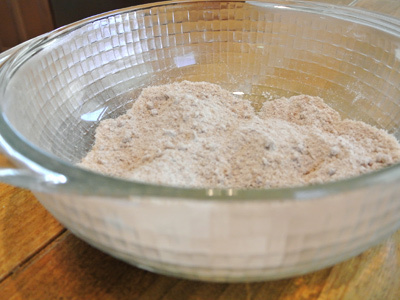 Combine dry ingredients in a large bowl together. 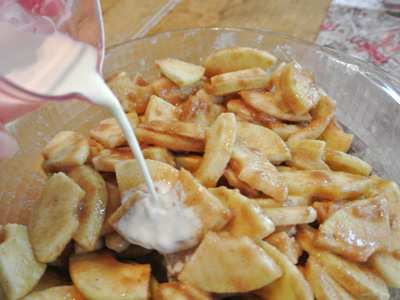 Add apples and toss to mix. Add vanilla, heavy cream and melted butter and stir to combine. 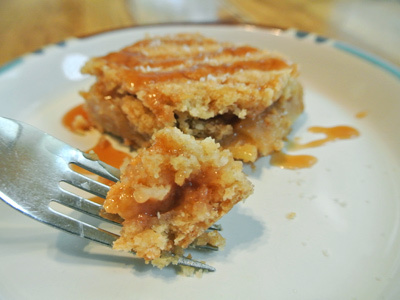 Spread apple mixture over the crumb crust and drizzle salted caramel sauce. 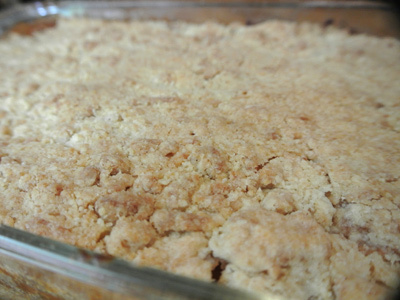 Add the remaining crumb topping over the top and pat down gently. Bake at 375 for 35 – 40 minutes or until crust is golden brown. Cool completely before cutting bars. 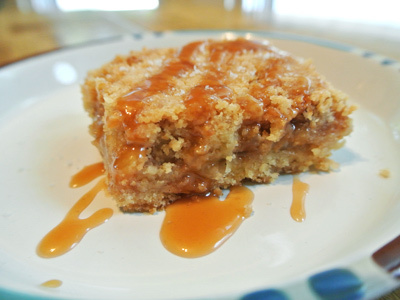 Drizzle with Salted Caramel Sauce and sprinkle with Sea Salt if desired.